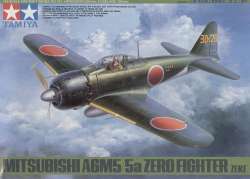 Very highly detailed kit from Tamiya of the Mitsubishi Zero (Zeke) which has optional parts to build either an A6M5 or an A6M5a. Other options include raised or lowered flaps, open or closed cooling flaps, wooden or metal drop tanks and markings for three different aircraft. Five pilot figures are also included.